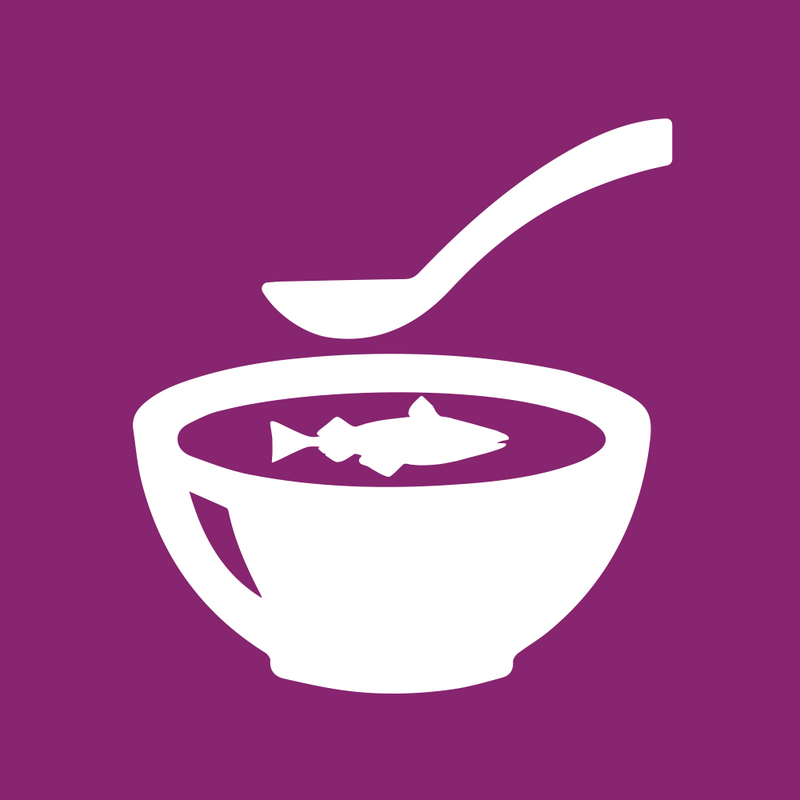 WorldFish analysis of fish value chains aims to reduce losses and improve the availability, accessibility and affordability of nutritious fish for poor consumers. The first harmonized fish standards in Southern Africa, approved in 2017, could significantly enhance cross-border fish trade, improving food security and income for the millions of people who are directly employed in fisheries and aquaculture in the region. Efforts to boost cross-border trade have become increasingly prominent elements of African regional integration and economic development agendas. However, trade is constrained by inadequate market and trade infrastructure and poor policy implementation. These lead to high transport costs, complex and unaligned trade rules and deficient market information, all of which prevent Africa from optimizing the social and economic benefits available. This is exemplified by the fish trade. WorldFish data gathered at various border posts in the four trade corridors of Southern, Eastern, Central and West Africa showed a massive movement of fish between countries. The results also showed how customs and bureaucratic formalities at the border posts hampered this movement. For instance, at the Katimamulilo border post between Zambia and Namibia, an inspector from the Zambia Bureau of Standards reported that cross-border trucks carrying fish products sometimes spend six to seven days waiting for their goods to be cleared. In response, the European Union-funded, WorldFish-led FishTrade for a Better Future project (2014–2018) was established to provide an evidence-based understanding of the challenges facing cross-border traders and to make recommendations that inform crucial policy decisions. In the Southern Africa Development Community (SADC), a regional economic bloc of 15 countries, it was noted that the lack of harmonized regional fish standards and conformity assessments pose a particular challenge to fish traders. As a first step toward introducing harmonized fish standards, in September 2016, WorldFish and SADCSTAN, a body mandated by the SADC Council of Ministers to coordinate regional standardization activities and services, convened experts from the SADC Fisheries and Sanitary and Phytosanitary (SPS) Technical Committee, and the Common Market for Eastern and Southern Africa (COMESA) Secretariat, along with various national livestock, fisheries and revenue authorities, to undertake a familiarization tour of the Chirundu one-stop border post (OSBP) between Zambia and Zimbabwe. Manufacturers can import or export their fish and fisheries-related products without non-tariff barriers because there is equivalence in the treatment of both local products and imports within the region. OSBPs give neighboring countries authority to enact their rule on the other country’s side of the border, meaning only one stop for people and goods crossing the border. OSBPs were introduced in 2009 to accelerate and simplify cross-border trade but until recently were not focused on fish. Since 2016, FishTrade has supported a pilot for an OSBP for fish at Busia, between Kenya and Uganda, helping traders to avoid the bureaucracy, double inspections and taxation that have undermined fair and speedy trade across the border. Following the visit to Chirundu, WorldFish convened a meeting of SADCSTAN’s Technical Committee on Fish and Fishery Products Standards. The meeting explored how harmonized standards would be implemented in SADC countries without compromising quality and safety by involving all stakeholders in the fish subsector. The outcomes of the meeting culminated in the presentation and approval of 11 harmonized standards at the 20th SADCSTAN Annual General Meeting on 15 March 2017. The standards cover 11 products and areas, including fresh, frozen, farmed, salted and smoked fish, fish snack products, fish sausages, canned sardines and Good Aquaculture Practices (GAP) for bream fish (tilapia). It is now the responsibility of member states to align national fish standards with the SADC harmonized standards as well as improve the dissemination of information on the standards and strengthen the capacity of SADCSTAN to coordinate their implementation. Zambia is currently leading the way, with the Zambia Bureau of Standards launching the country’s harmonized fish standards and implementation plan in November 2017. Once the implementation process is complete, the expected benefits from better access to intra-regional markets on competitiveness and food security, and a more rational exploitation of natural resources, could be immense. 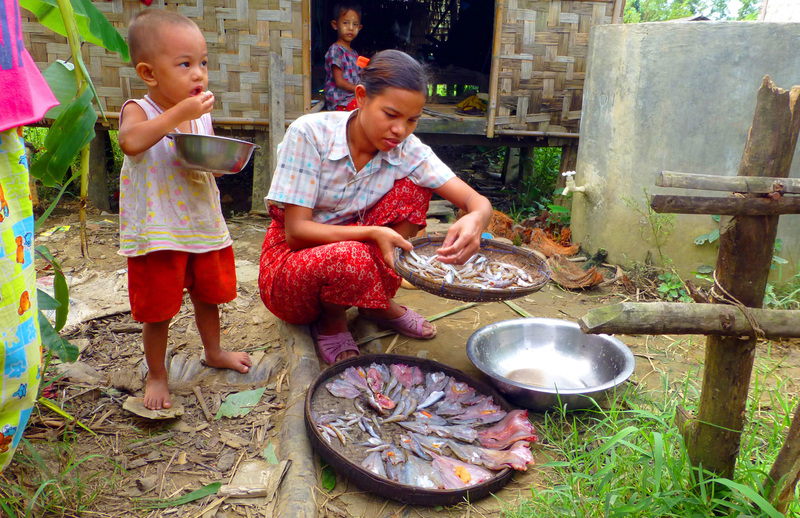 WorldFish is teaching poor, rural households in Myanmar to grow micronutrient-rich small fish alongside carp species in homestead ponds—an approach that research from Bangladesh and Cambodia shows can boost at-home consumption of fish and impact nutrition outcomes. Households in Myanmar spend nearly as much money on fish (14 percent of food expenditure) as on rice (19 percent), and average fish consumption is estimated to be just above the global average, at 21 kg/person/year and increasing. Over 50 percent of animal protein consumed in Myanmar comes from fish. Yet these figures hide a range of consumption patterns. 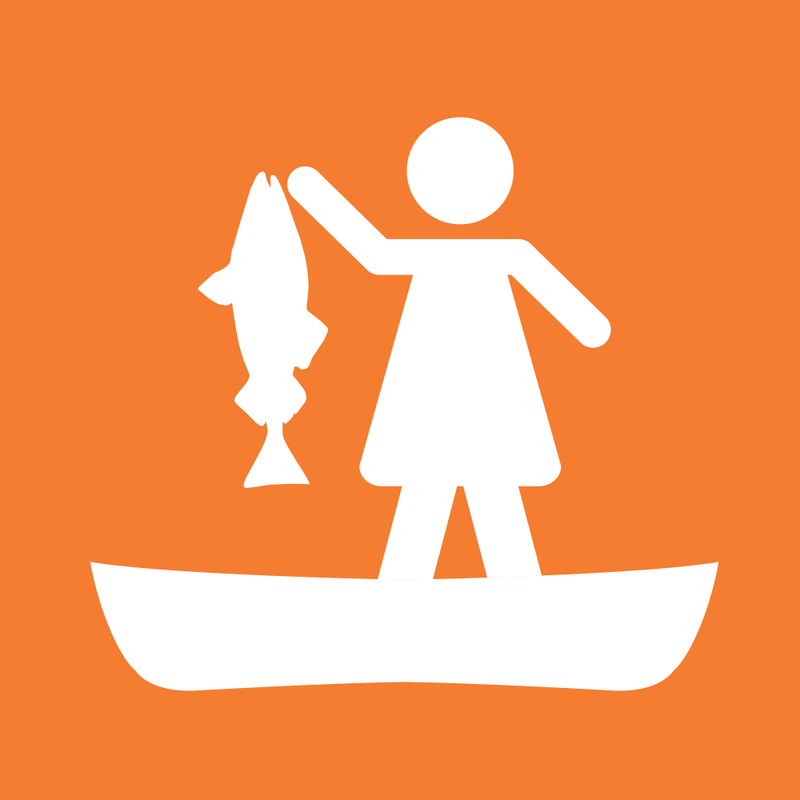 Women and children tend to eat less fish than men because of social norms that affect the distribution of food within a household. And despite fish being a cheap animal-source food, it is still unaffordable to many, resulting in diets that rely heavily on rice and are low in diversity. These factors contribute to the country’s undernutrition rates, which are the highest in Southeast Asia. To improve the nutrition and livelihoods of poor, rural households, the Managing Aquatic Agricultural Systems to Improve Nutrition and Livelihoods in Rural Myanmar (MYNutrition) project (2015–2019) aims to increase household production and consumption of micronutrient-rich small fish, particularly among women and young children, as well as boost household income through the sale of fish. Funded by the International Fund for Agricultural Development (IFAD) and led by WorldFish, in collaboration with the Department of Fisheries and local NGOs, MYNutrition is part of FISH. The project focuses on the Ayeyarwady Delta, where malnutrition rates are among the highest in the country and there are 200,000 subsistence fish farms, many of which are underutilized or derelict. The project provides training to women and men in targeted households on how to grow carp species alongside micronutrient-rich small fish species such as mola (nga bel phyu) in homestead ponds, a system known as carp-mola polyculture. Mola is a small indigenous species that grows well with other fish and reproduces frequently. It can be partially harvested often, providing a constant supply of fish for household consumption. This makes it the ideal species to farm alongside carp, which accounts for around 70 percent of all farmed fish in Myanmar. WorldFish first implemented carp-mola polyculture in 2011. Research shows that the technology is an effective, low-cost, nutrition-sensitive approach that increases pond productivity and the nutritional quality of the total production. It also promotes small fish consumption in the household. When the dry season is approaching, you will not worry about food because you already have access to food from your own home. Daw Aye Win’s household is one of 133 that have been trained and supported to farm mola since 2016. By the end of the project in 2019, the project aims to have reached 300 households. When eaten whole, mola is an excellent source of micronutrients, such as vitamin A, iron, zinc, calcium and vitamin B12, as well as fatty acids and animal protein, all of which are needed for good health and development, particularly in the first 1000 days of life. Traditionally, the head and organs of mola—the most nutritious parts—are removed before cooking. As part of the training on essential nutrition and hygiene actions, family members learn about the nutritional benefits of mola and the best ways to prepare the whole fish, such as fried mola balls and mola ball soup with vegetables. The project hopes word-of-mouth sharing about nutritious ways to cook mola will help to boost consumption of small fish among 700 households engaged in small-scale aquaculture. To reach this target, the project is drawing on lessons learned by WorldFish and partners in Cambodia, where nutrition training was given to fishing-dependent households between 2012 and 2016. This helped to boost household consumption of small fish by 13 percent on average, and increased consumption of small fish by children under 5 by 23 percent among households in the project target areas. Addressing malnutrition is a complex challenge. Efforts by WorldFish and partners are helping to tackle some of the immediate and underlying causes, which is enabling poor households to lead healthier and more productive lives. WorldFish research shows that sustainable management and good governance by community members can increase the productivity and diversity of rice field fisheries. Rice field fisheries (RFFs)—the fishing that occurs in and around seasonally flooded rice fields—are a vital source of food and income for almost all rural households in Cambodia. 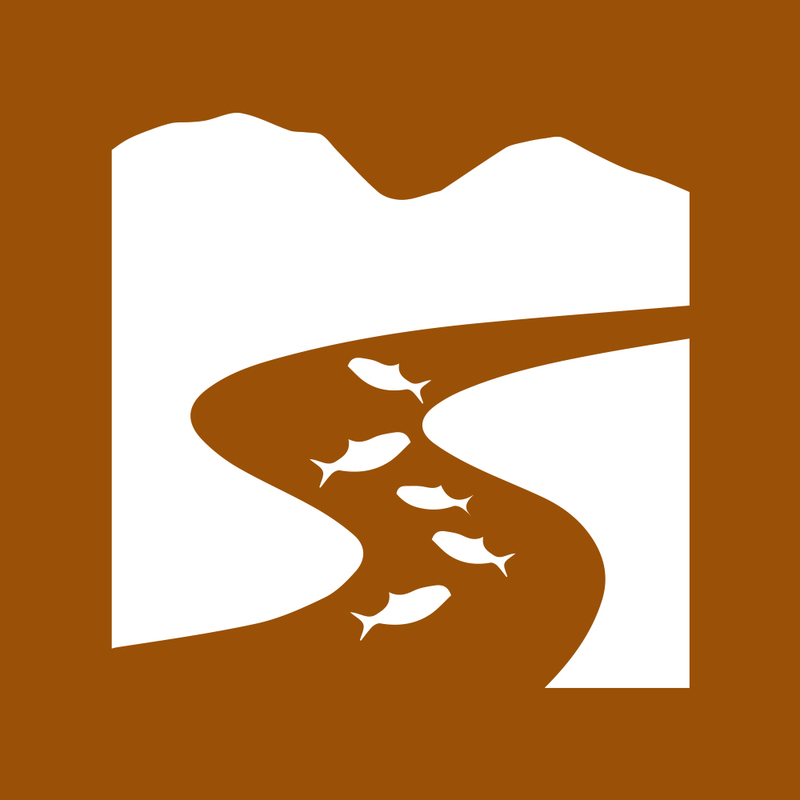 But these fisheries, which provide 20–25 percent of the inland fish catch and are home to many species of fish and other aquatic animals, are under threat from overexploitation, habitat loss and environmental degradation. Through the USAID-funded Feed the Future Cambodia Rice Field Fisheries II (2016–2021) project, WorldFish and its partners are working to sustainably increase the productivity of RFFs. The project focuses on Pursat, Battambang, Siem Reap and Kampong Thom provinces around the Tonle Sap Lake, where dependence on RFFs is greatest. Building on phase I, the project is replicating and scaling up best practices, including efficient water use and promoting the nutritional benefits of consuming fish. By the end of phase II, the project aims to bring 5221 ha of water bodies under improved natural resource management and to boost annual average fish production in RFFs by 50 kg/ha, equivalent to a total additional output of more than 10,000 metric tons. 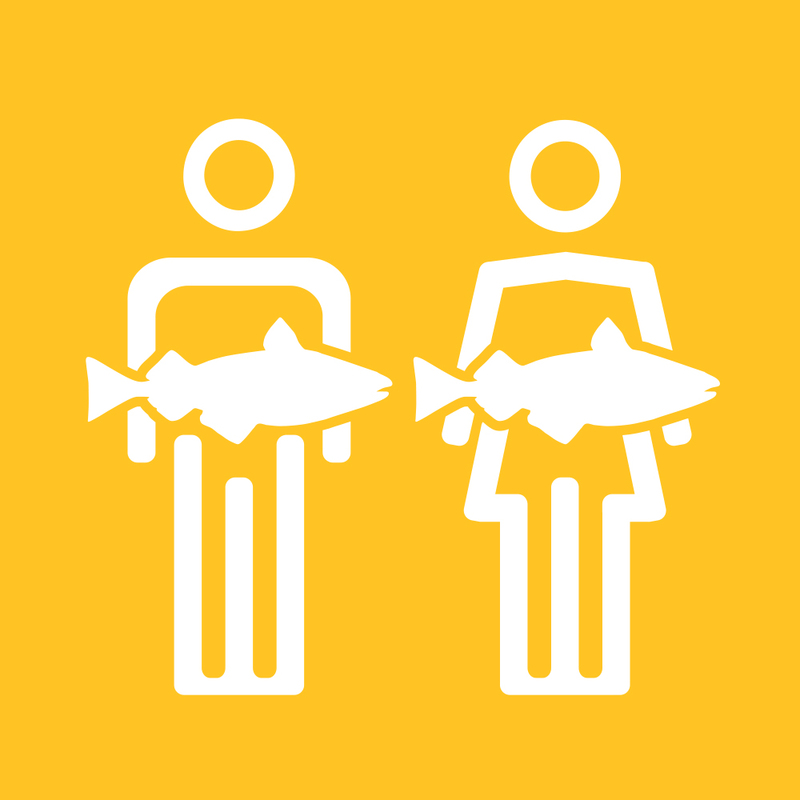 It is also anticipated that 97,220 people, of which 58,681 are women and children under 5, will consume more fish. Central to achieving these goals is the good governance of community fish refuges (CFRs). CFRs are natural or human-made ponds that hold water throughout the year and provide a dry season sanctuary for brood fish. In the wet season, when water levels rise, the fish migrate out of the CFRs to the rice fields and floodplains to spawn and feed. 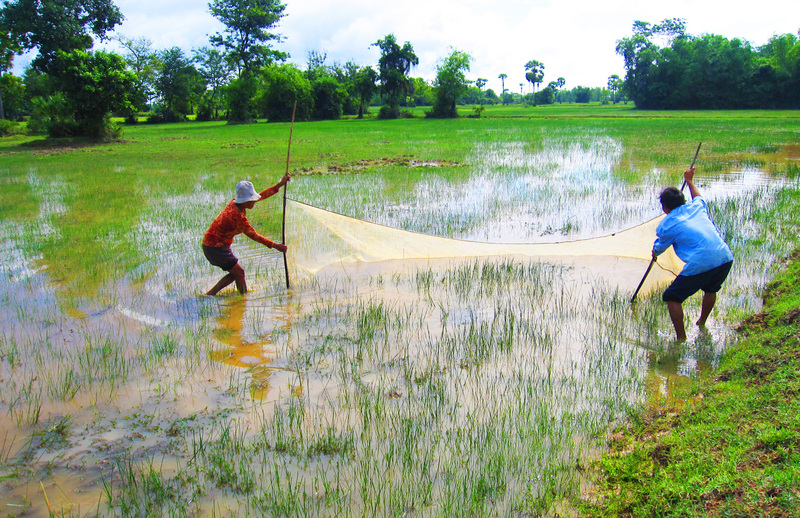 Fishing is prohibited year-round in the CFRs, but rice fields become open access when inundated. CFRs are governed by committees, which are made up of local volunteers who are elected by the community. WorldFish research shows that strong CFR committees coordinate better with local authorities and agencies, reduce resource-use conflict, embrace innovation and are more likely to raise funds for CFR maintenance and enlargement, resulting in higher yields in rice fields while maintaining fish biodiversity. During phase I, the project supported 40 CFRs, benefitting 86,372 people. By the end of 2017, the number of CFRs had been significantly increased to 134, which is expected to benefit 569,546 people. Each CFR has established a committee. Through WorldFish partners, committee members receive training in areas such as CFR management, fisheries law, stakeholder engagement, problem analysis and action planning. Ongoing coaching and follow-up visits by project staff ensure that action plans are implemented. Of the 134 action plans submitted in 2017, 73 contained plans for CFR enlargement. When completed, this work will add 236,018 m3 to the 475 ha already managed by communities. The costs are covered by contributions from the households who benefit from the CFRs, funds raised by CFR committees and Commune Council investment, depending on the local situation. The aim is to make the CFRs self-sustaining by the end of the project. Fundraising activities often include placing collection boxes in public places and pagodas, but some CFR committees have identified site-specific opportunities. In 2017, using knowledge gained from study visits organized by the project, the committee of Damnak Kranh CFR in Pursat province introduced an eco-tourism scheme. Over the three-day Pchum Ben holiday, one of the most important festivals in the Cambodian religious calendar, tourists were invited to visit the CFR, which is a demarcated zone in a larger reservoir, generating USD 1900 in parking and entrance fees. In total, the committee raised almost as much in 2017 as it did during phase I. Across the CFRs, committees raised USD 18,613 in 2017. Scaling up best-practice methods like these will ensure that fish, which accounts for 76 percent of animal-source protein intake for households, is available and accessible to all poor and rural families in Cambodia.